Here’s the latest background I did at Plain Joe Studios for River Valley’s Go Kids program. This is by far my favorite background I’ve done for them. Or maybe it was just the most fun to illustrate. I think I just have a dark side to me that I enjoy something a little more spooky in a fun, Saturday-morning-cartoon sort of way (though I don’t at all care for ‘horror’ as a genre). To be entirely frank (because, like Groot, “I am Frank”), I’m lazy about geometric precision. 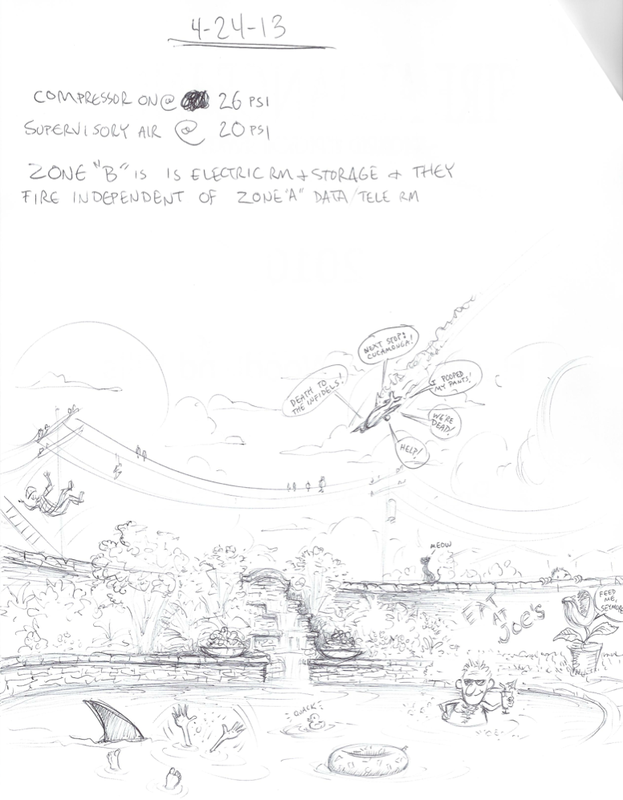 Give me a jungle to draw any day over a city scene with skyscrapers and bazillions of windows and everything needing to be in perfect perspective — forget about it. The fun thing about a cartoon ghost-town like this is that I can get all wonky with the structures, which is really fun. Throw in a hint of swamp and a giant skull rock and you’ve got the makings of a Scooby-doo episode. Now this is my cup of tea! 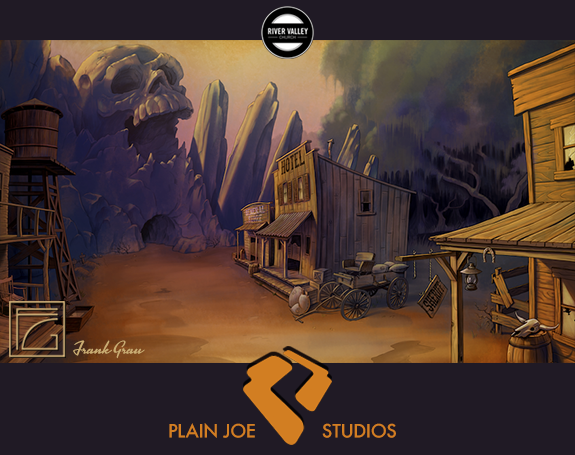 Here is yet another illustration I did at Plain Joe Studios to serve as a background for one of our client’s Go Kids characters. The character below is Adi Mole, so this rendering is an exterior of an underground “world” which this character inhabits. I enjoy creating these wonky sort of perspectives sometimes for backgrounds. I just think it makes them a little more interesting, especially when doing any kind of continuity storytelling, like when I create storyboards or comics. In those latter two situations, things would get stale if every shot was from a straight-on POV. Before getting the Cintiq, I used to sit at my drawing board with a large stack of copy paper next to me and doodle away, tossing those drawings into the trash as I created them. I didn’t throw them away because they were bad. I threw them away because I created so much of it that it wasn’t feasible to keep and store a lot of nonsense sketches which served no purpose beyond my having some fun doodling. After getting the Cintiq, however, I would do the same thing digitally. So basically, I’d create a Photoshop document, create a new layer, start doodling, delete the drawing, sketch something else, delete that, and so on. It just didn’t make sense to keep so many sketches, even digitally. Then I decided I could keep the files if I just created one file, create a layer, sketch on it, lock the layer and turn it off, then start a new sketch on another layer, lock that and turn it off, and sketch again on yet another layer and so forth. This way I could have one layered document with 20 or 30 doodles on it. The problem, of course, is that the file thumbnail only shows the visible layers, so if I want to find a sketch among so many files, there’s no way to tell which file has the layer with the sketch I want. This really isn’t such a problem, because if I ever liked a sketch enough to go back to it, I’ll usually save a separate jpeg of it anyway. These days, if I want to doodle digitally, I’ll create a Procreate file and just do different sketches on different layers. The nice thing about Procreate is the video feature, so instead of having to open a file and look through so many layers, I can just create a video of my sketch sessions and going through that video will show me what’s on a particular file. So how do you doodle for fun? Here’s a little Christmas doodle I did on Procreate a couple nights ago. I know I need to cultivate a habit of posting regularly and I think Procreate’s progress video feature is a great way to share the creative process, even if it’s just personal little doodles and stuff. I notice when deciding what to sketch, I tend to default into character design of some sort. Characters (being persons, more or less) are, well, more personal than a still life, landscape, architecture, etc., and I think they’re more likely to grab people’s interest more so than things. Well, at least they grab my interest more. 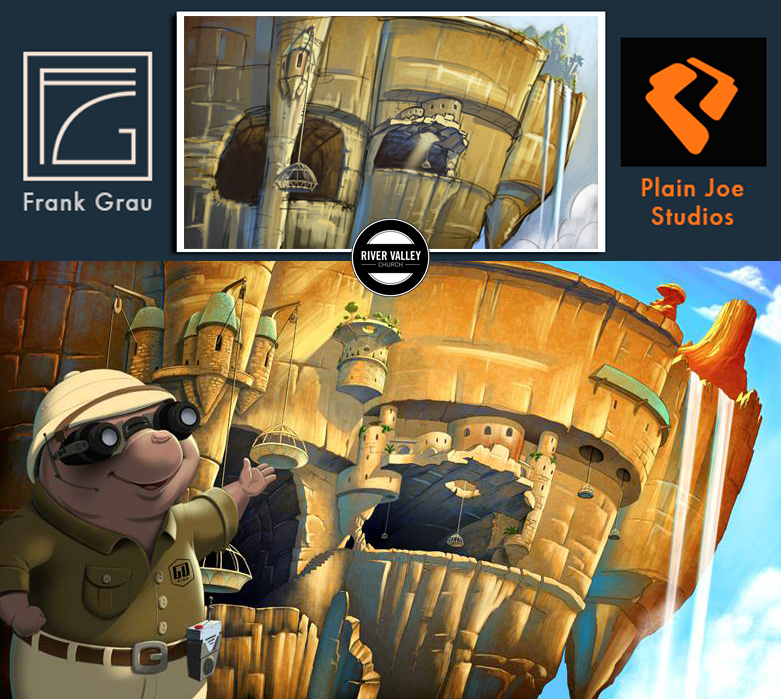 The one thing about working at Plain Joe Studios is that I’m more aware of the importance of storytelling. And it’s not that I didn’t care about telling stories with my art, it’s more that I’ve always sort of told stories or at least implied them without really being aware that I was doing so. And I’m not suggesting that an image needs to tell a full-blown narrative, but that it’s something that the viewer can look at and imagine in their own mind a story to go with what they’re seeing, even if that simply means they want to know more about a character. I recently came across an old chicken-scratch I did on a notepad while helping out a friend with his fire-life safety business. I was waiting at a fire panel while he was doing some testing out in the field. Back then, he was going to get his home swimming pool area redesigned and asked if I’d design some kind of little fountain while I waited idly at the fire panel. I mean, since he was paying me to help him anyway, and since I’m an artist, there was no point in paying me just to stand around when he could get some artwork out of me. So I complied and doodled out a rough idea according to what he had in mind. Since I had more idle time than needed, I decided to embellish things. I guess one of us scanned that page, because I recently came across it while going through old emails. The thing is, I never would have sketched something like this in one of my sketchbooks. This is really just a casual I-don’t-care-how-it-looks-and-never-expect-anyone-to-see-it kind of sketch. I only share this because it occurred to me after seeing this that I rarely break away from something familiar when I draw. This doodle, though stupid and sloppy, is something I never would have done on my own in a sketchbook. I found it to be uninhibited and, well, sort of fun, like I didn’t have a care in the world what anyone thought of it. And I probably wouldn’t have given it a second thought except that there was a sort of Mad Magazine cartoony charm about it that I wish I could infuse into other things I do. I don’t look like this, but I certainly feel like this whenever I’ve been working all through the night until the next day.